A timingerror that caused two segments of a privately built Falcon 1 rocket to collideafter liftoff doomed the booster?s third flight test by the California-basedfirm SpaceX, company?s chief said Wednesday. SpaceX CEOElon Musk said his engineers have traced the cause of the Aug.2 launch failure to a timing error between the shutdown of the low-cost Falcon1 rocket?s first stage engine and the separation of its upper stage, leadingthe two segments to bump into one another instead of separating harmlessly. ?We have quitea definitive understanding of what went wrong on the last flight,? Musk toldreporters in a teleconference, adding that the timing error was on the order ofseconds. ?If we were to increase that gap by even a second or two, this problemwould not have arisen.? Based inHawthorne, Calif., SpaceX — short for Space Exploration Technologies — launchedits third Falcon 1 rocket late Saturday EDT from the U.S. Army's Reagan MissileTest Site on Omelek Island in the Kwajalein Atoll, which sits about 2,500 miles (4,023 km) southwest of Hawaii in the central Pacific Ocean. Musk saidSpaceX would be releasing video of the staging event that clearly shows thatthe first and second stages separated as planned about 2 minutes and 20 secondsinto the flight, but that unanticipated residual thrust from the redesignedMerlin engine caused the first stage to bump the second stage just as it beganto fire. Both halves of the rocket then fell into the Pacific Ocean well eastof the U.S. Marshall Islands and were destroyed along with its payload of two small NASA satellites and the Trailblazer demonstration satellite for the Pentagon. A container containing the cremated remains of people, including those of astronaut Gordon Cooper and actor James Doohan of television's "Star Trek", who had paid to have their ashes launched into space was also lost, according to the space memorial firm Celestis, Inc. The rocket waspowered by SpaceX?s Merlin 1C engine, which uses a regenerative cooling systemthat funnels propellant through a series of channels along its engine nozzle beforeignition. Previous Merlin engines used ablative cooling systems that burnedaway material to shed excess heat. Musk saidthat simply extending the Falcon 1 rocket?s 1 1/2-second separation sequenceshould solve the problem. SpaceX engineers pinned the glitch down for sure onTuesday and are determined to aim for orbit a fourth time, he added. ?If we hada rocket on the launch pad tomorrow we could make this timing change, launchand be okay,? Musk said. The recentfailure marked the third in a row for SpaceX since the Falcon 1?s debut inMarch 2006, when a fuelline leak and fire thwarted the inaugural launch just after blast off. 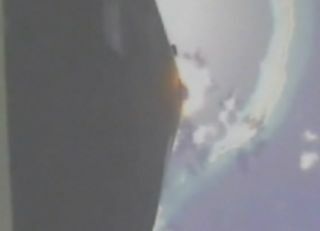 A 2007test flight lasted about five minutes, enough to undergostage separation, before it also failed. Musk saidthat in contrast to the second test, which found other potential problems afteranalysis, SpaceX?s post-launch assessment of the Aug. 2 flight has found noother near-miss issues that need to be worked before the next launch. As aresult, Musk is confident that Falcon 1 will be flying again before the end ofthe year. Componentsfor the fourth Falcon 1 rocket to are expected to head to SpaceX?s Omelek Islandlaunch site in a few weeks, Musk added. SpaceX?sFalcon 1 rocket is a two-stage booster that stands about 68 feet (21 meters)tall and carries a reusable first stage designed to be recovered in the oceanand refurbished for future flights. The $6.7 million rocket is designed to loftsatellites up to 1,256 pounds (570 kg) into low-Earth orbit. The rocketis the first of SpaceX?s family of Falcon boosters, with engine test firingsalso underway for the larger Falcon 9 launch vehicle. As itstands, SpaceX expects to have its next Falcon 1 in place for a fourth launchattempt as soon as September. That launchwill now be a demonstration launch, Musk said, since SpaceX had previouslypromised to its next customer, the Malaysian space agency, that it would proveFalcon 1?s ability to reach orbit before attempting to launch the company?sRazaksat spacecraft. ?I?ve nevergiven up and I?ve never lost,? Musk said. ?And I?m not going to start now.? Space NewsStaff Writer Brian Berger contributed to this story from Washington, D.C..